The Student Of The Year series seems to be the ultimate platform for the initiation of young talent into Bollywood. The first film from the installment, starring Alia Bhatt, Varun Dhawan, and Sidharth Malhotra, came out seven years ago and made the actors instantly popular. 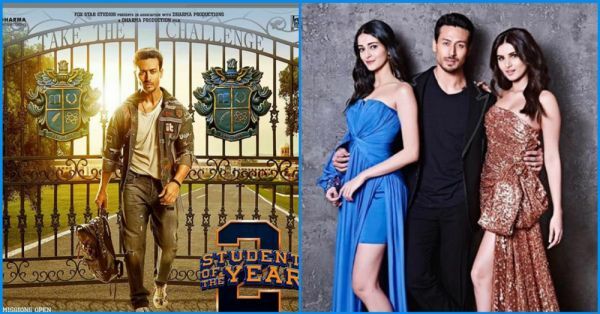 One of the most-awaited movies of the year, Student Of The Year 2 is going to Dharma Production's next big release and will introduce two new starlets - Ananya Panday and Tara Sutaria. The makers of SOTY 2 shared new pictures from the film and said that the new session will begin on April 11, indicating that the wait for the movie's teaser is finally over. Oh my god, aren't y'all excited? While we wait for the release of the teaser, Tiger Shroff took to Twitter to post two new posters of the upcoming movie and captioned it: "Back to college, and feeling pretty lit about it! #SOTY2." Tiger also shared a still with his back towards the camera and captioned it, "Are you ready? #SOTY2." The words Take The Challenge can be seen written on the college gate. Tara Sutaria shared the same poster on her Instagram and captioned it, "Always got your back @tigerjackieshroff #SOTY2", whereas Ananya Pandey said, "Never 'back' down! Tiger shared another poster in which a girl is stepping over a boy’s foot, indicating that the movie is going to include a 'battle of the sexes'. Tiger captioned it: "Take the step, take the challenge. #SOTY2." Karan Johar took to his Instagram to introduce the characters of the leads from Student Of The Year 2. Meet Tara as 'Mia', Ananya as 'Shreya' and Tiger as 'Tiger' (apparently!). The movie's leading actors, Tara, Ananya and Tiger, made an appearance on Koffee With Karan earlier this year and talked about their personal equations, their social media personas and answered some awkward questions about each other. Student Of The Year 2 is hitting screens on 19 May 2019.